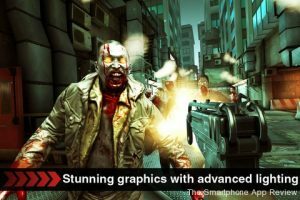 Dead Trigger is the latest iPhone and iPad game from Madfinger Studios, the team that brought us the Gears of War clone, Shadowgun. The first thing that may strike you about Dead Trigger is the astonishing visuals, as they really are brilliant. 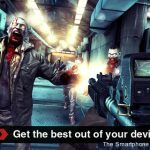 Madfinger claims they are ‘console quality’ and in many ways they are right. 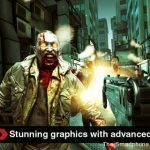 The use of lighting is especially impressive, and the zombies themselves look very good, and are undoubtedly the main reason for that claim of console quality. 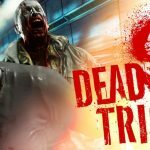 They move well, and are the subject of some hilarious rag doll physics that will keeping you laughing as you experiment with different weapons to see what you can get the zombies to do. The weapons are also very nice looking, especially the reload animations. The only thing that puts a downer on the visuals are some of the animations when the zombies are crawling or getting up, and they don’t always look quite as good from a distance. 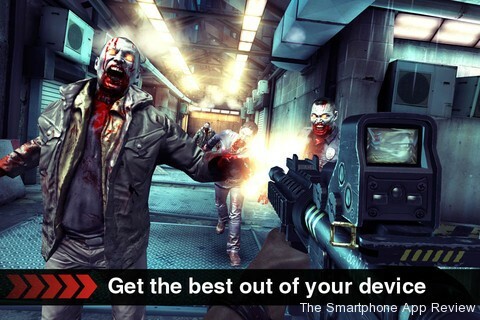 The game is a first person shooter, but unlike other zombie based FPS games, this isn’t really a dash to freedom type of game, although there are some levels like that. This features small levels with definite zones and areas that must either be cleared or defended, although there are sometimes missions where you have to grab an item, and there are a few other different objectives here and there. In most levels you clear an area, at which point the doors open and the level expands a little. This usually results in more zombies pouring in. There can be quite a few zombies on screen at one time, so luckily there is a proximity radar to help you keep tabs on things. The radar is a good addition, but I think its range could do with being extended a little. Once you have finished a stage, you are taken to the main map screen, which is also very nice to look at, as it encapsulates the entire city, with your missions shown as locations, as well as shops and safe-houses. Any money you earn or find in the missions must be spent on upgrading your character with perk like items, as well as new weapons and upgrades for old weapons. There are two types of currency at play, gold and silver, which predictably leads to a large quantity of IAPs to choose from. The IAPs are, I feel, a bit much in a game that you have already paid to download. OK, so they are not technically needed to complete the game, but trust me, you are going to have to redo a lot of missions to unlock some of the better kit in the shop. I wouldn’t mind this, but as I said, this does feel like a bit much for a paid game. One way or the other, guys. 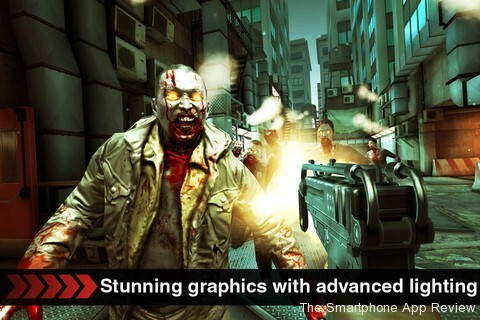 The game itself plays well, as well as any good FPS game can on iPhone. The zombies are satisfying to kill, and there are certainly enough levels here, especially with the random missions feature. There is a general lack of ammo, but I feel this is how it should be, as learning to dodge zombies and conserve ammo is part of the fun. 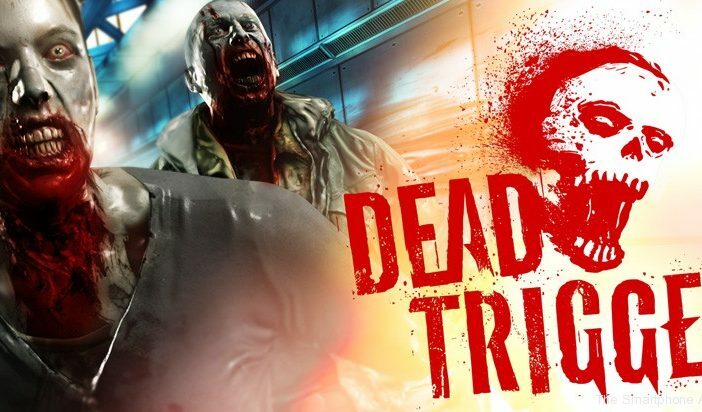 A big hint here if you are having trouble with the game is to try and headshot the zombies whenever possible. Headshots are tricky on the touchscreen, but simply line up the correct angle with your right thumb, and then use the left, (movement) stick to aim. Once you get the hang of it, you will be popping headshot after headshot, saving a whole load of ammo in the process. There are some nice cutscenes interspresing the action, although I do feel that more could be done when you first start playing, as the game simply drops you into a level with little help and just a text screen to tell the story. Overall, this is a decent shooter that will probably keep you going for a good few days, or even weeks if you really get into it. I would have liked some online modes, as this would have been perfect for some co-op action, and the presence of IAPs in a paid game is troublesome, but you are looking for a new, stunning looking FPS game, then you have just found it. Check out our reviews of Astrowings 3, Mega Run and Darkside! Can’t go wrong with zombies.